What is Sushi Made Of? 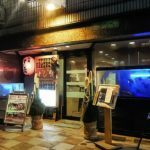 Is Sushi “Special” in Japan? Can sushi make you sick? Okay, guess what. Sushi (寿司) doesn’t mean raw fish like you probably imagine anytime you hear the word. That sushi chef in white with that cool hat masterfully crafting the perfect piece of sushi. Weird right? I know it surprised me too. The word sushi is actually referring to the rice used when making sushi! Which has vinegar in it. 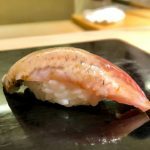 Alright with that out of the way lets dive into what sushi is made of because you’ll be surprised to learn that sushi is much more than just raw fish on rice. Before we dive into the various types of sushi, let’s chat for a little bit about what sushi is made of. You’re probably thinking that sushi is some raw fish on top of rice, but there is more to it than that. Even the rice is special in sushi. This is the sushi rice I just mentioned a moment ago. It’s a special mixture of rice, vinegar, sugar, and salt. Some shops will add their own special twist. Traditionally it’s mixed in this cool little brown wooden bowl called a hangiri (半切) using a wooden paddle called shamoji (杓文字). This is where sushi gets really interesting. It’s really the main part of sushi, the part you would order when at a sushi restaurant in Japan. For example, maguro-sushi. It’s sushi-Messi with a slice of raw tuna on top. There are probably hundreds of different toppings to be placed on top of the sushi-meshi. Technically, neta translates to ingredients, but for sushi, it means the topping or the filling inside a sushi roll. You’ll find seaweed used in different ways for sushi. It’s what wraps makizushi (sushi rolls, more on that later). Sometimes a thin strip is used to wrap the neta on nigirizushi (hand-pressed sushi, more on this later too). The seaweed adds flavor and makes some sushi easier to hold since traditionally sushi is eating with your hands. This is that dab of green stuff that sort of tingles and burns a little when you eat it. It adds a bit of zest to the sushi. A long time ago it was used as a sort of antibiotic to protect the stomach from the raw foods. Today that’s not as important, it’s more for flavor. There are many types of sushi to learn about, most aren’t very common. 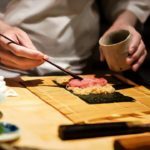 Japan enjoys very simple sushi, albeit with a highly refined taste — and that may be at least half the reason it is amazing here. Instead of trying to tell you about every type of sushi there is I’m going to focus on the most common sushi you’d find when you visit Japan. Now, this is exactly what you imagine when you think of sushi. A slice of seafood on top of an oblong wedge of rice. This topping is called the neta (ネタ). Nigirizushi translates to hand-pressed sushi. It is literally the ancient, hand-crafted sushi like you see in the movies and ultra-high-end Japanese restaurants. Or, the nearly instant, auto-made stuff you find in the kaiten-sushi, aka the conveyor belt sushi. Yes, most of it is nigirizushi, but they aren’t making them all by hand these days. Nope. They have some real fancy machines that pop out just the right sized rice with the perfect shape. This is a really old video but it shows off the kaiten-sushi chef (do we still call them chefs?) using the robot — I suppose it shows still some amount of skill required by the operator. Gunkanmaki (軍艦巻) translates into warship roll. Weird right? I know… I thought the same thing. Even though it has -maki in the name it is a type of nigirizushi. You may have seen it. Gunmaki sushi is where the seaweed wraps around the perimeter of the rice leaving space on top for the topping of your choice. Maki means roll in Japanese. So I think you can easily imagine what makizushi is right? In Japan, they are typically rolled with the nori (seaweed) on the outside. In fact, sushi rolls with the rice on the outside are called something different: uramaki — which translates to inside-out roll. Here’s a fantastic video showing how makizushi is made. I like how it shows a very simple recipe, one like you would actually find in Japan. Within makizushi there are various sub-types of sushi rolls: futomaki (太巻 thick rolls), hosomaki (細巻 thin rolls), ehomaki (恵方巻 lucky direction rolls), and temaki (手巻 hand rolls). It’s a sushi roll eaten on a special holiday called setsubun (節分 the day before Spring). The interesting thing is it is fully eaten while remaining silent, and facing the “lucky direction” for the year (where each year will have a different lucky direction). It’s an intriguing tradition in the Japanese culture. Did you know there is a sort of sushi without the rice? Yep, it’s called sashimi (okay, technically it’s not sushi… but it is very closely related). Here’s Toshi Maeda from Japan Headlines explaining ehomaki. Real quick I want to go over the most popular fish/seafood items used for nigirizushi. This is just a list. I will revisit this article in the future and add more detail to each entry. Like I said, this is just a list. I will be taking a lot of time to explain each in greater detail in my reference section soon. More to come on these. So what does it mean if you decided to slice these ingredients up and eat them without rice? I’ll cover sashimi in another article, but for now, you can think of sashimi as sushi without the rice — thinly sliced fish, octopus, squid, etc. neatly arranged on a plate ready to grab with your chopsticks. Sashimi is essentially that simple — and it is crazy popular in Japan. There is so much that goes into making good sushi. So much that it’s easier to watch very well made video that will answer this for you. This video exudes the craftsmanship that goes into Japanese sushi. Hats off to the team and Tasty for the effort put into this video. After watching this very well-made video do you think sushi is special in Japan? I know what you’re thinking. Sushi in America is super expensive and found in those exotic upscale Japanese restaurants. Yes, they do eat sushi for family events like birthdays and holidays. Usually ordering sushi delivery like we’d order a pizza in the U.S. But if you look at the massive amount of people waiting in line to be seated at the average conveyor belt sushi restaurant on the weekend, you know it’s eaten more commonly. Heck, even weekday dinner times can be pretty darn busy. It’s crazy. Japanese people will wait over an hour for their sushi. It’s like being stuck in line for the hot new ride at Universal Studios. In fact, pro tip, if you’re in Japan and craving some sushi — don’t try to go on the weekend. If you do, go at weird hours outside of normal lunch or dinner times. Here’s a video showing off just how busy conveyor belt sushi restaurants can be. Gonpachi Nori-Temaki is a hand-wrapped sushi (temaki) spin-off from the famous Kill Bill restaurant chain, Gonpachi, in Shibuya, Tokyo. Modern sushi is extremely safe. There are steps taken to ensure you won’t get sick. From fish being frozen before server to the rice mixed with vinegar, sushi is a very safe food when eaten at reputable sushi shops. Nope. While most of it is, there are some toppings that are cooked first such as shrimp, octopus, crab, and egg. Occasionally you’ll see grilled fish used as well, but that’s more of a shop trying to add variety than a staple of every sushi shop. When sushi does have something wrapping it, it is wrapped in a seaweed called nori. Much of nigirizushi is just rice, wasabi, and the topping. Sometimes you’ll find a strip of nori wrapped around the sushi. It looks like the nori is holding the topping on the sushi. Other times you’ll see a wide strip of nori wrapped all the way around the sushi, with the topping piled on top (this is called gunkanmaki). Sushi rice is called sushi-meshi in Japanese. It’s vinegared rice that adds zest to the sushi but plays an important role. 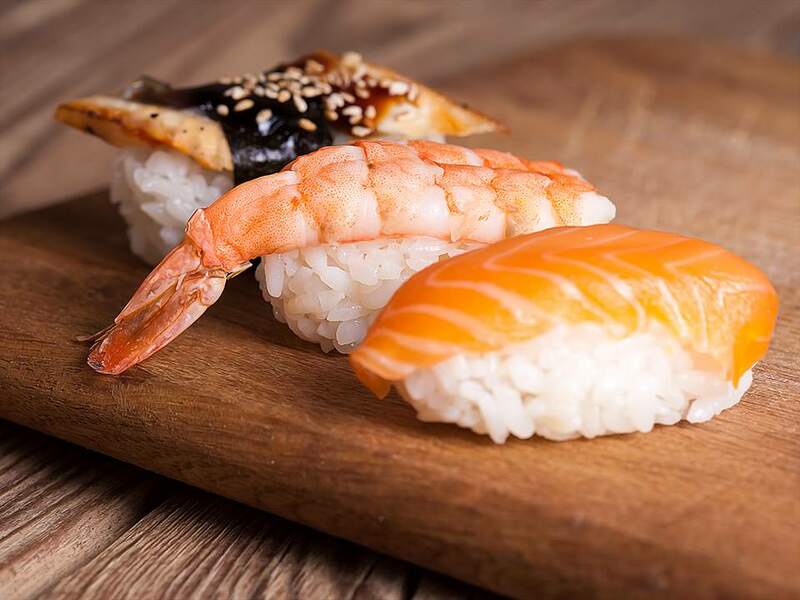 The vinegar also helps make sushi safe to eat by dropping the PH of the rice — preventing dangerous microbes from growing. It means exactly what you think it means. It’s a very high-quality fish that can be eaten raw. Though, keep in mind most of the fish used in Japanese sushi shops has been frozen to ensure it’s safe to eat raw. Supermarkets in Japan have a wide variety of sushi grade fish — whole sections with blocks of tuna and salmon for example. Yes… but I wouldn’t recommend it. While the seafood topping of the sushi would freeze and then thaw fine, the rice and seaweed part would not. It’ll become soft, sticky, and much less enjoyable. It’s not unsafe though as long as you’re not letting it sit for long before freezing — standard kitchen rules apply. In Japan, it is usually recommended not to eat sushi while pregnant (they tend to avoid all raw foods while pregnant). Traditional sushi is Japanese rice, some sort of topping like fish, seaweed, and wasabi. Rice just isn’t keto-friendly. I have seen sites talking about sushi using cauliflower rice… but I’m not really sure we can call that sushi. Stick with sashimi if you want a keto-friendly sushi-like food.